Using a membership application form, visitors to your Wild Apricot site can apply for membership in your organization from their computer or mobile device. The membership application form consists of two main parts: the initial screen where the applicant choose a membership level, and the membership application form. The initial membership application screen is automatically populated using the membership levels you have set up. The membership application form that follows is automatically assembled using the common fields and membership fields you have set up. The instructions for setting up your membership levels, common fields, and membership fields appear in the sections below. 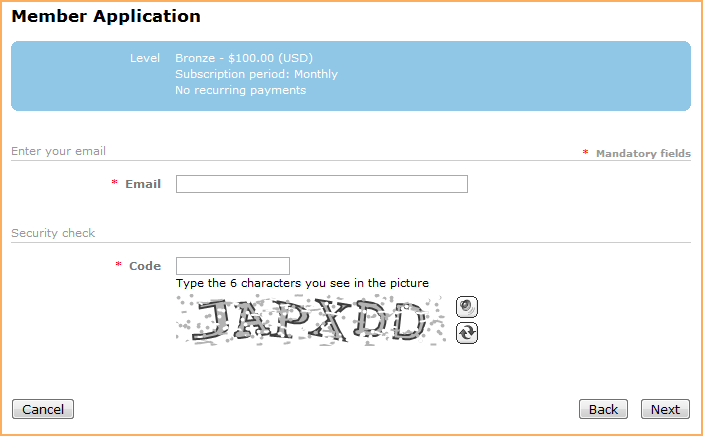 As well, you can adjust the membership application gadget settings to control which membership levels appear on the form. You can have multiple membership application forms on your site, and adjust the settings on each application form so that only specific membership levels are shown. Membership application forms – like other site content – are inserted as gadgets, in this case, a membership application gadget. You cannot add a membership application gadget – or any other singular gadget – to a page template or system page, or to a page containing another singular gadget. 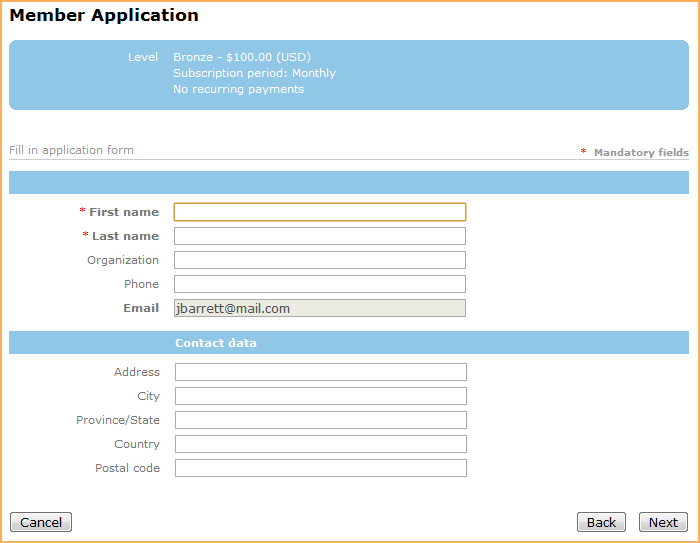 You can embed a Wild Apricot membership application form into another website using widgets. Once the application is submitted by a prospective member, a new record is automatically added into your database and a number of automatic actions take place. Among other actions, an application invoice is generated, and password emails are sent. If the chosen membership level requires payment or administrator approval before activation, then an application initiation email is sent. Otherwise, the member activation email will be sent. Until the membership is activated, the applicant will have a status of Pending - New. Setting up the membership application form involves the following steps. You can create as many membership levels as you want, each with its own pricing, subscription periods, and renewal policies. 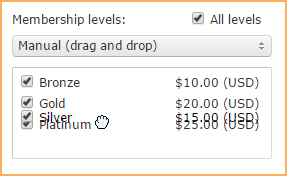 To set up your membership levels, click the Levels option under the Members menu. A membership level will appear on the membership application form if its Public can apply option is enabled. For more information, see Membership levels. The fields that appear on the detail page of the membership application form are drawn from your membership fields and common fields. 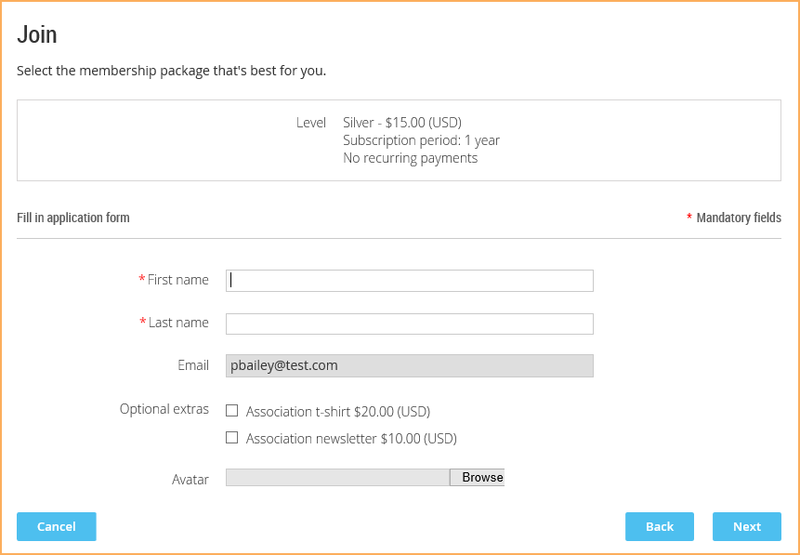 You can create custom membership fields and restrict them to specific membership levels. You can also create common fields that apply to all Wild Apricot forms (for example, event registration forms). Common fields and membership fields will appear on your membership application form even if the Others access setting for that field is set to No access, and even if that field is set to No access on the Member privacy settings screen. To create or customize membership fields, hover over the Members menu and click the Membership fields option. To create or customize common fields, hover over the Contacts menu and click the Common fields option. You can add field instructions to explain what each field on the membership application form represents. To allow or require membership applicants to upload files as part of the membership application process, you can create a file attachment field as a membership field or common field. For more information on using file attachment fields, click here. For more ideas on ways you can use file attachments to benefit your organization, click here. Hover over the Settings menu and select the Finances option. Click the Payment settings option. Check the Enable online payment option. Select an online payment system and provide your account details. For more information, see Online payments. Go to Sites pages (under the Website menu) and create or begin editing the site page where you want the application form to appear. Drag the membership application gadget from the list, and drop it where you want it to appear on the page. You can insert it into a section within a layout, or above or below a layout. From the gadget settings panel on the left, choose the desired settings for your membership application form. 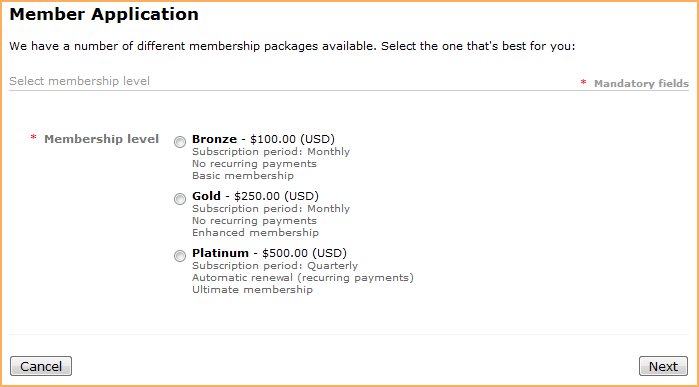 Among other things, you can control which membership levels are available. For more information, see below. Now that you have added a membership application gadget to your page, you can adjust the gadget settings. ...and determine the order manually by dragging and dropping levels within the list. Within the Advanced section, you can enter CSS code or classes to further control the appearance and behavior of the gadget. You can add a description to your membership application form by inserting a content gadget ahead of the membership application gadget. Within the content gadget, you can add a title and description, and format them using text styles. For more information on adding and formatting text, see Using the content editor. You can change the colors and text styles used on your membership application form from the Colors and styles screen. For a complete list of the elements you can modify, click here. Discounts for online membership applications can be set up using membership discount coupons. You cannot use membership discount coupons for free membership levels, or for levels that use automatic recurring payments. 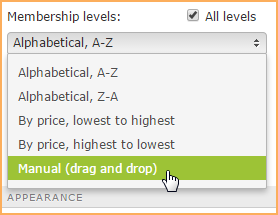 To create a discount for membership applications, hover over the Members menu and select the Discounts option. 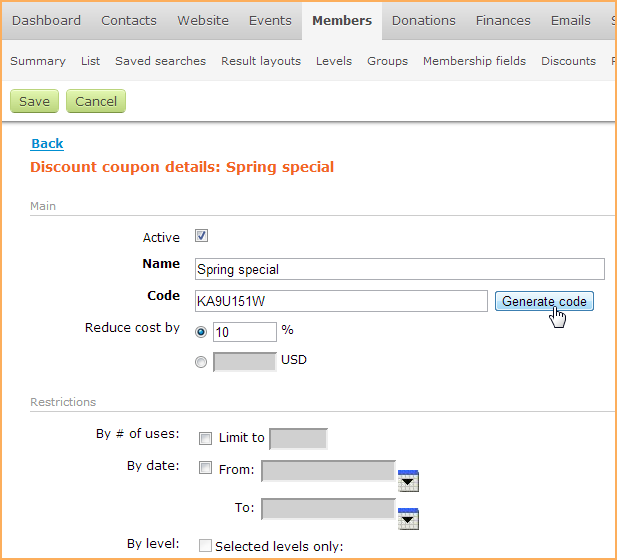 From the Discount coupons screen, you can create discount coupons, and enter or generate the coupon code. For more information, see Discounts for online membership applications. There can be several steps involved in applying for membership in your organization. If there are multiple membership levels, the first step of the application process is selecting the membership level. The next step is to enter an email address. If enabled, a Captcha anti-spam section will appear. If the applicant's email address already exists in your contact database – because they had registered for an event or made a donation – they will be prompted to log in before proceeding. Common fields – These fields are common to all contacts and forms and display regardless of the level being applied to. Membership fields – These are additional fields that apply to members only. All custom membership fields can be restricted to specific member levels only so different member levels can have different fields. The common fields are shown at the top while the membership fields are shown below. If the selected membership level that has a discount code associated with it, a Discount code field will appear on the detailed application form where the applicant can enter the discount code. What happens next depends on the payment method chosen when the membership level was set up. If only offline payment was enabled, then the applicant will have the option of cancelling or confirming the application. If the applicant clicks the Confirm button, an invoice will be emailed to them, and a membership application summary will be displayed. From the application summary, the applicant can choose to view or pay the outstanding invoice. If only online payment is enabled, then a Pay online button will appear. Clicking the Pay online button will take the applicant to the online payment screen for your site's payment provider. If both online and offline payment is enabled, then two buttons will be displayed: Pay online and Invoice me. Clicking the Pay online button will take the applicant to the online payment screen for your payment provider. Clicking the Invoice me button will result in the applicant being emailed an invoice – which they can pay online or offline – and a membership application summary being displayed. From the application summary, the applicant can choose to view or pay (online) the outstanding invoice. In all cases, a new contact record is added to your database. Depending on your membership level settings, the application may have to be approved by administrator option and/or payment may have to received in full before the membership is activated. An invoice is automatically generated. An invoice email will only be sent if the online payment is not completed within 15 minutes of submitting the membership application. Within your invoice and receipt settings, you can disable invoice emails completely. A password is automatically generated and emailed. The password email can be customized from Settings > Contacts > Password email. Depending on the membership level settings, an application initiation email can be sent. If online payment is initiated but not completed, the transaction will stay marked In progress for 24 hours, after which it will be automatically marked as Probably abandoned. You can search for contacts with failed payment using the Attention required filter and typing abandoned into the search field.